Having a simple white tee shirt can help with any wardrobe dilemma. It works well with anything, pair with tailored trousers or even a printed skirt for a simple office outfit. Personally, I think you can never have too many white tee shirts, round necks, v necks and even the length makes a difference sometimes. Here are a few white tee shirt looks for the office, all images from Pinterest. Another essential for the wardrobe is the button-down shirt, especially a white shirt. It can be worn under a jumper (refer to my post on layering) but works just as well on its own with trousers or skirts. Style shirt by rolling up the sleeves and loosely tucking it out. 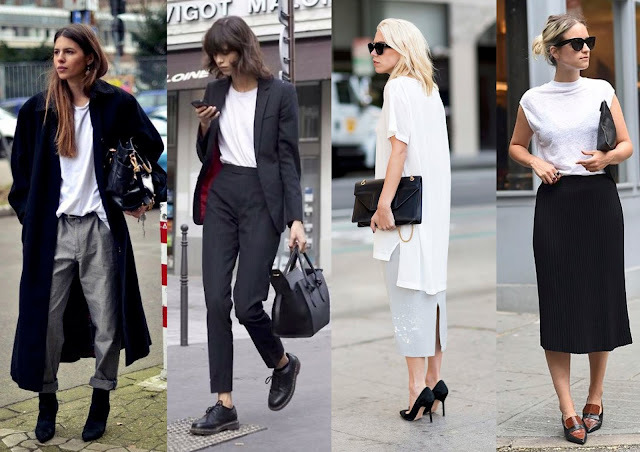 A pair of well-tailored trousers is a must, preferably in black, navy or grey, it's probably one of the most important workwear essentials to have. Another favourite is a plain black or neutral colour jumper/sweater, boring as it may be, but this will save you time in the morning if you're having a wardrobe crisis. Below are some jumper and trouser looks. Lastly, the tailored blazer, great for power dressing but just as good over jeans and trainers. The blazer can be used for layering up in the winter and an easy throw on piece in the summer. All images are from Pinterest, check out my boards for more inspiration. A few other workwear essentials include Breton top, black/grey tee shirt, black dress and pencil skirt. Thanks for reading and I hope this helps those of you that needed some guidance getting ready for work.